1) The paper is written by Jan de Graeve, FIG International Institution for the History of Surveying and Measurement and honorary member of FIG, to celebrate the 500 anniversary of Gerand Mercator. Furthermore it will be presented at the FIG Working Week, History Workshop in Rome, Italy May 2012. The paper is a short introduction to the life and work of Gerand Mercator to highlight the exceptional place he has in the history of the surveying profession. Keywords: Mercator, Quincentenary, Atlas, Projection. 2012 is the quincentenary of the birth of Gerard Mercator. Although best known for the map projection named after him he was also known for the Mercator Atlas, indeed even the introduction of the word "Atlas" and for his work in cartography but maybe not so much for his basic work as a land surveyor. This paper is a short introduction to his life and work to highlight the exceptional place he has in the history of our profession. Gerard Mercator's name rings a bell, as a cartographer, the Mercator atlases, the Mercator projection, construction of mathematical instruments and globes, but primarily he made his living as a land surveyor. He was born in Rupelmonde, in Flanders, on March 5th 1512, 500 years ago, from parents who sold and repaired shoes on market places. His original name was Gerard de Cremer (a market merchant) and his name was latinised during his studies at Louvain. The University was chartered in 1525 and basic studies were the trivium and for those studying sciences the quadrivium of arithmetic, geometry, astronomy and music. During his studies, he met Gemma Frisius who introduced him to astronomy. As he had difficulties understanding the complexity he started reading geometry, using an Euclid edition by Vogeler, published in l529 in Strasburg: Elementale Geometricum ex Euclide Geometra, a Jerome Voegeler as a start. To get an advanced knowledge, he went on to read Oronce Fince's: Liber de Geometra Practica, 1544, either the Latin or French version. 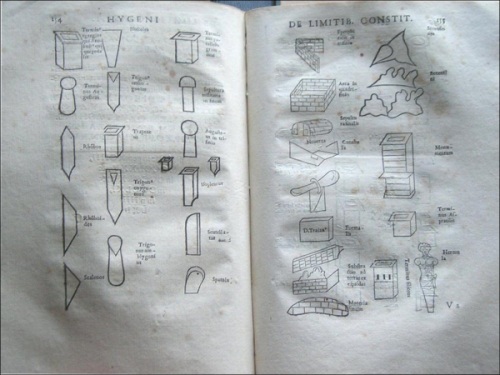 This we read in a letter he sent to Mr Haller in 1581, to whom he explained how he improved his knowledge of geometry. In the same letter he explained how he read about border disputes, in some book, but could not remember the name of the author. I found out that it must have been the Galland first edition of 1544: De Agrarum dimentionibus. This convolute of Latin texts from the Roman authors explains that in Roman times the lands were allotted to the veterans once they became 40 years old and received their salary for a long life serving the army. This book deals not only with the mathematics of land division and border limits but explains the law systems and legislation that has governed most land divisions in the Roman empire, not only in Italy but also in North Africa, Spain and other Roman territories. The surveyors used a "secret language", a kind of coordinates in length to find distances between the border stones. This system could still be of some inspiration for our colleagues today. As a Land Surveyor Gerard Mercator had practised measuring land and solving border disputes, well before starting his career as a cartographer. From Gemma Frisius he read: De locorum describendum ratione, published for the first time in 1533, as an annex to Petrus Apianus: Comographia by Bonte in Antwerp. The principal was simple. In a triangle there are 3 angles and 3 distances. If you know 1 distance and 2 other data, you can solve the triangle, and find (or calculate) the other elements. It was written in Diets or Flemish. The instruments were very much like the back of an astrolabe, used in a horizontal manner. His first important map, presented to the Emperor Charles V by the city of Ghent in 1540, was called: The Flanders Map. It was a fairly precise map using the intersection method explained above. He was commissioned to produce this beautifully engraved map by Granville, but he did not do the field work; Dr Eric Leenders and I found evidence that Jacob van Deventer did the fieldwork. Jacob van Deventer measured all countries belonging to the emperor Charles V. (1500 - 1557). The cities from where the other villages were intersected were marked by a double concentric circle. Curiously no historian or cartographer had understood the significance of this double circle. The larger cities are engraved and marked with a large church symbol, the smaller with a small chapel. Of this the centre was each time marked with a single circle. Only Gerard Mercator used this system and it is only very recently that this system was unveiled to the world of the cartographer. This is despite the fact that the original text on the map of Ghelderland (in the Netherlands) clearly explains it "in Dutch". Unfortunately not so many scholars read the inscription on the maps, which are often written in Latin or in the vulgar languages from 16-l7th centuries and are more difficult to read or rather "decipher", or are printed in Gothic. This major achievement in a short time ( a half year for the engraving) could only have been realised by a close collaboration between the land surveyor measuring from church towers and forming the triangles into a small network. The engraver was G. Mercator. The instrument for measuring the angles had a compass built into the full circle and the instrument could be oriented to the North (magnetic north). The deviation of the compass was only discovered later although Mercator made a substantial contribution to describing the deviation of the magnet and finding out that the magnetic Pole was not situated on the Earth's North - South axis through the Poles. He described that in his correspondence with John Dee, from Cambridge. In 1546 Gerard Mercator wrote a long letter to André Perrenot de Granville on February 23 rd. where he explained that the magnetic North did not correspond with the geographic North. The implications were the need for map projections. He was apparently one of the very first to describe the magnetic deviation. In 1544 G. Mercator was suspected by the "Holy Inquisition" of heresy and put in jail for 6 months in the fort of Rupelmonde. In fact, he was solving a property dispute in what is today Zeeland, between the villages of Axel and Hulst, where 2 religious communities of Ghent, the Abbey of St-Pieters and the Abbey of St-Baafs, both claimed the same land to be their property. At the same time Gerard Mercator stayed in Rupelmonde to solve some inheritance problem as well, from a deceased uncle of his. As he was absent from Leuven, where he normally lived with his family (Barbara Schellekens and children Romuald, Bartholomeus, Arnold and Emily), the sheriff was looking for him as he was on a list of' possible heretics, some of which had been executed. In the l6th century, the propagation of protestantism was firmly opposed by the Roman Catholic Church, and the books by Calvin, Luther, Zwingler and others were not allowed by law and prohibited, the sanction: the death penalty. This is probably one of the reasons why Gerard Mercator moved in March 1552 to Duisburg, in Germany on the Rhine. One of his great patrons, the Emperor Charles V had abdicated in 1550 and moved to Juste in Spain. The prospects to see a university created in Duisburg was another reason to go and live in a more tolerant religious environment. Gerard Mercator measured a large part of Lotharingen (in the French region of Lorraine) and during the time spent there he injured himself seriously, he fell ill and never returned to land surveying leaving this activity to his son Romauld who measured the city of Duisburg and Arnold Mercator received a privilege from Maximilian II for a map of Koln in 1571. Gerard Mercator did read a lot of books, and his library was sold in 1604 l0 years after he had passed away. A public auction of the Mercator library was organised in Leyden (Netherlands), an impressive 1000 books, in 900 volumes, were sold: there were also religious books: 50% catholic books and 50% others, historic works, scientific books and others. A large portion of the history books involved what we would call geography. There were about 200 books on mathematics and also Libri Politores, which we could call "rare books". Most books in l6th century were written in Latin, the universal language, but also in "Gallici", books in Italian, Spanish and French, and Teutonici: English and or Flemish (Diets) and German. In the 19th century, there was controversy between scholars about Gerard Mercator; was he German?, was he Flemish?, born in 15l2 in Flanders, he went to Duisburg in 1552 and died there in 1594, so 40 years in Flanders and 42 in Germany. He signed always: Gerardus Mercator Rupelmondanus or GMR, as, for example, on the border of an Astrolabe. In fact he was a real European writing and reading in Latin, the learned language, Flemish or Diets, French, English, German, Spanish, Italian but no Greek. The books in his library were printed in many languages and we found his correspondence also in all of the above languages. Although Gerard Mercator did not travel very much even for a l6th century learned person, from his correspondence we understand that he had a fairly good knowledge about the latest discoveries not only in the New World but also in Central and East Asia. One of his most important contributions for the time was his Chronology which he produced in folio in I567, first edition. From his readings he chronologically wrote down all the important events known in history books not only the dates of coronations or deaths of kings, battle fields or peace treatises, but also natural phenomena, earth quakes, volcanic eruptions, appearances of Stella Nova, sun - and moon eclipses noted in history books and he recalculated them all in the different calendar systems: by the Jewish - Greek Olympiades - in Roman calendar from Romulus and Remus and by the Mohammedan and Christian calendars. A second edition appeared in 4º in 1575. His chronology, and his publication of the revised Ptolomeus Atlas, as part of his Opus Magnus including geography and cosmology, was unfortunately not finalised before 1594. We cannot ignore the Mercator projection as it is still in use today particularly in navigational maps for aviation. In navigation a major problem was to draw on a flat map a large region which is on a spherical globe. One has to explain in two dimensions a three dimensional reality. If on a ship you want to go from A to B, you can calculate the angle that your ship will cross the meridians passing through both poles. The line which joined the points crossing all the meridians with a similar angle, is called a loxodrome, which is a complex curved line ending up near the pole, but is intricate to calculate. Mercator tried to understand and solve the problem by turning the complex loxodrome into a straight line and changing the meridians into parallel lines, distorting the areas near the poles. To compensate he invented the system of increasing latitudes. 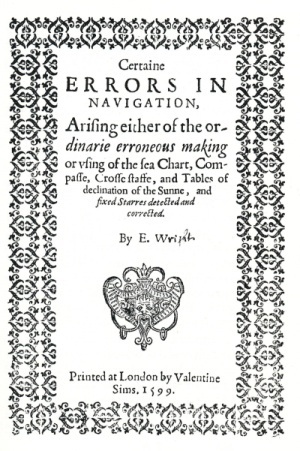 He applied his system in a famous world map Ad usum navigatium, 1569, but it took a long time before the system was mathematically explained and proved by William Wright in Certain errors in Navigation, published in 1599 and 1657. Before 1595 there had been individual map productions and also volumes published with many different maps. The candidate buyer chose the maps he needed and had them bound together. So, if you wanted to go from Central Europe to Jerusalem, you do not need the maps of Spain, nor Portugal, nor France nor parts of Africa. For travelling to the Americas those maps were essential even if they were imperfect but the rest of the world was then not needed. If you want to go from Rome to Antwerp or Amsterdam, you need the maps of Italy, Switzerland, Germany and the l7 provinces. The maps were bound together on demand. Mercator issued the full set of maps. His first atlas, published posthumously in 1595, by his son one year after he died, was given the name "Atlas", which has been in use even since. On the occasion of the 500th anniversary, a facsimile has been issued by Mercatorfonds in folio edition, and a Verlag produces a large reprint in full size in colour. The learned introduction to both is written by Dr Thomas Horst from Munchen originally in German, but translated into English, French and Flemish (Dutch). 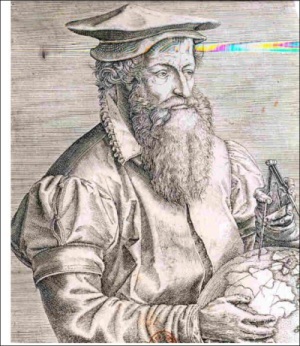 Mercator died in December 1594 in Duisburg, at the advanced age of 82. He is remembered for the Atlas, and his projection with increasing latitudes. As a perfectionist, he always wanted the ultimate precision which he learned in his earlier career as a land surveyor. He will be remembered as a Great European Land Surveyor and Cartographer. In Rupelmonde, their Highnesses Prince and Princess PHILIP of Belgium have unveiled a sculpture of the young Mercator, to inspire the future generation that every one can become an important person. In St-Niklaas: an exhibition in the local Museum STEM; the at the library of Gerard Mercator on the other side of the park is an exhibit "Mercator Digitalised" together with an exposition of 4l mathematical books from the Gerard Mercator library by Jan De Graeve. This runs until 1st July 2012.
in Antwerp: Plantin Moretus Museum: "Mercator and travelling in l6th century"
Le Livre et L'Estempe, journal of the Belgian Bibliophile society of Aril. 2012. 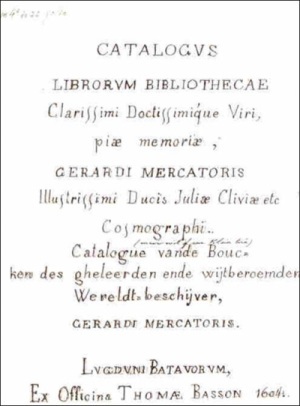 A 202 page paper by Jan de Graeve on the scientific library of Gerard Mercator. The photographs are from a presentation made about the books in the Author's library. Jan de Graeve is Director of the International Institute for the Hstory of Surveying and Measurement. (IIHSM). He is an Honorary member of FIG.